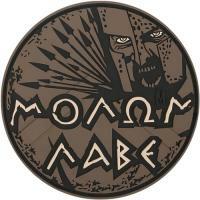 When the Persians demanded the Spartan King Leonidas and his 300 men to throw down their weapons, he answered "Molon Labe," or "Come and take them." The circular Molon Labe Morale Patch from Maxpedition pays tribute to the bravery of fierce Spartan warriors with impressive detailing. It is made from durable PVC rubber, optimized for surviving in harsh field and combat conditions. The patch is easily maintained and cleaned with regular soap and water to keep it always looking like new. Its hook-backing attaches to any loop surface and is compatible with a variety of Maxpedition packs. The patch includes a separate loop sheet that can be sewn onto apparel or accessories to show off an added personal touch. 510-TN A-Tac Google "The Hawk"